Spur Gastropub is located in the Belltown section of Seattle, WA, run by award winning chefs/owners Brian McCracken and Dana Tough, the same team behind other popular, gastronome-favored places like Tavern Law and Old Sage. 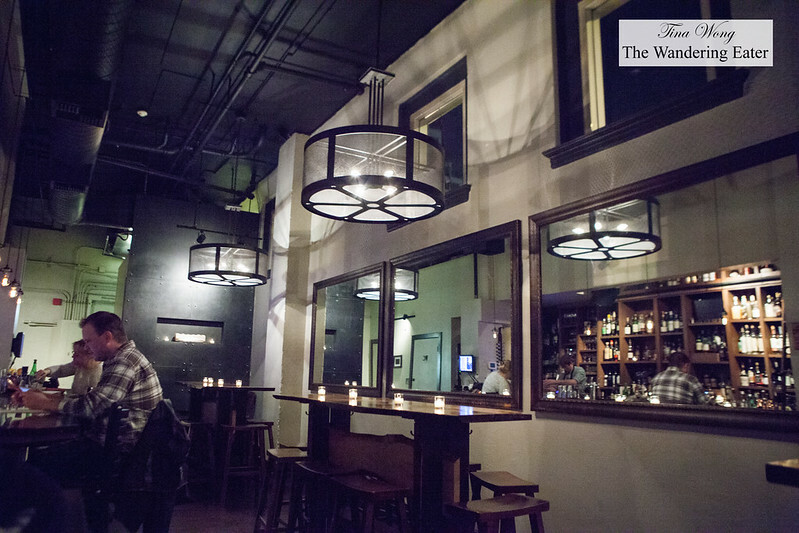 When you enter this understated nouveau-Western decor, you can’t help but notice the bar filled with great microdistillery spirits and the mostly young diners who are enjoying a couple of well-crafted cocktails and several plates of food. It’s a cozy space that has both modern and rustic. Wood trim and natural log tables coexist with hip light fixtures and ambient projections of black and white Seattle scenes. 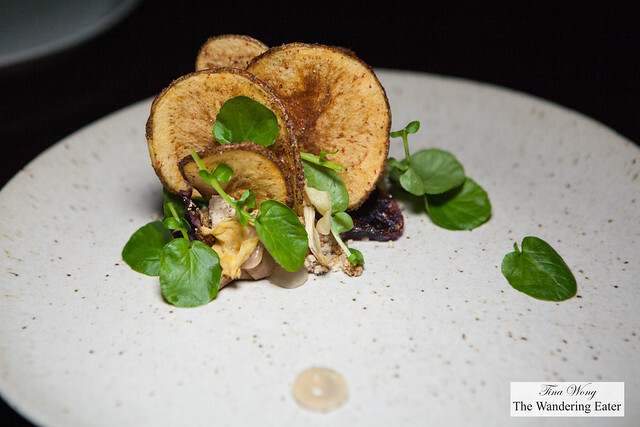 Spur’s menu is a short and smart list of about fifteen seasonal and signature small plates that is inspired by the local products but certainly open to experimentation with techniques (e.g. foams and gels) and trends. 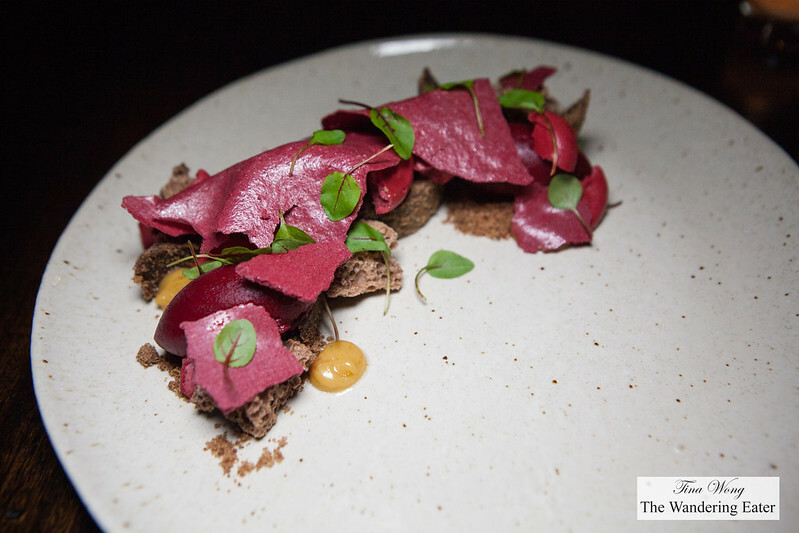 Despite of the haughtiness that might be associated with modernist or molecular cuisine, the food is absolutely delicious and everything is prettily plated with precision. We started off with the three small crostini arrived on the plate with perfectly cubed portions of slightly smoked salmon. The cubes suggested a little of the molecular gastronomy. However, it was the perfect marriage of flavors and texture. 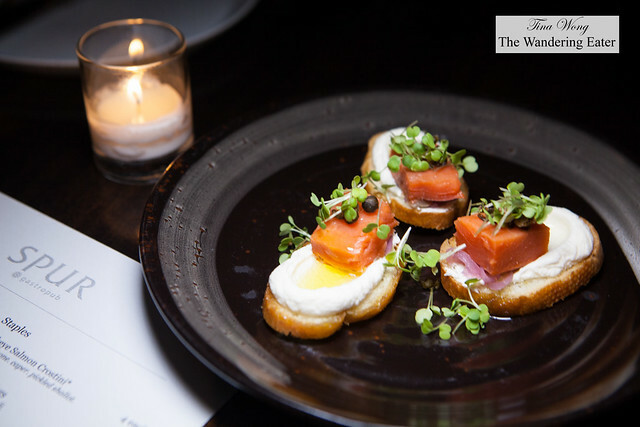 While salmon crostini is ubiquitous in the Northewest, but Spur’s version really drives the flavors much more cleanly and the addition of pickled shallot is brilliant. The chicken liver pâté was deliciously creamy, nutty and faintly liver-y in a very good way. The crunchy textures from the shredded cabbage and pine nuts. The thick, fresh made potato chips were a fantastic and fun vehicle to eat the pâté. We love veal sweetbreads and Spur’s version is great. 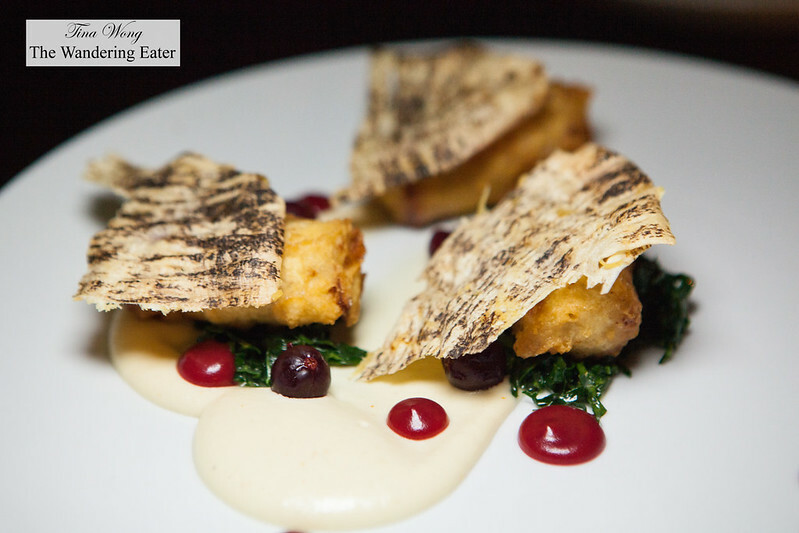 The expertly fried chunks of sweetbreads balanced between the creaminess and thin wispy fried crust and that chip of chanterelle was added more crispiness and the black kale added some sweet earthiness. The drops of sherry gel added a nice hit of acidity. 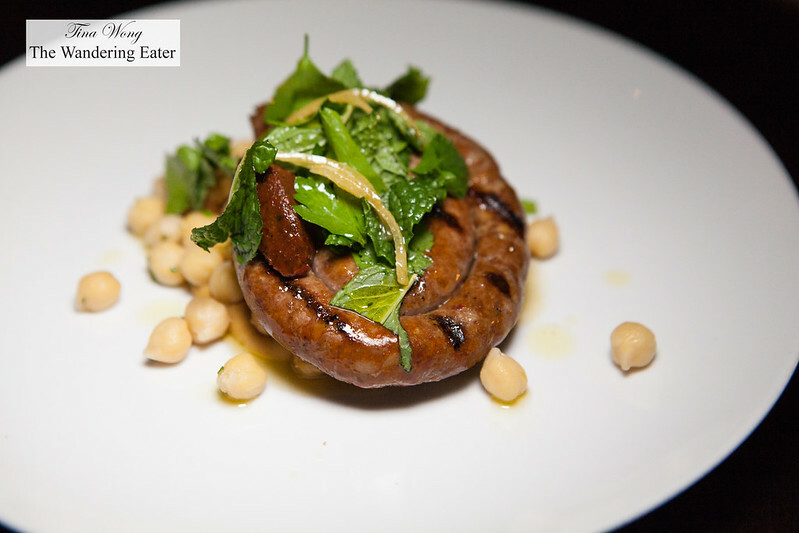 The rope of housemade Merguez sausage with chickpeas was a good take on Middle Eastern influenced dish. The chickpeas added heartiness and subtle nuttiness while the spicy harissa sauce added some pleasant heat to the dish and the parsley freshens up the dish. 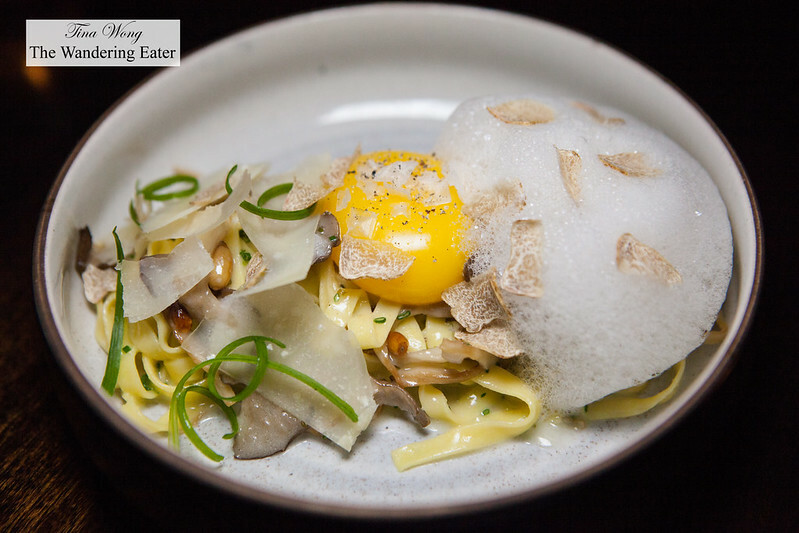 If there’s a dish you must order here, I would have to say is the fresh tagliatelle with sous vide duck egg yolk, oyster mushroom and pine nuts. The tagliatelle was perfectly al dente and the gently cooked egg yolk becomes the seductively creamy sauce for this dish. The oyster mushrooms mimicked the silky, chewy texture of the pasta and the pine nuts added some crunchiness and another layer of flavor. We started to feel full but still pressed on for dessert. 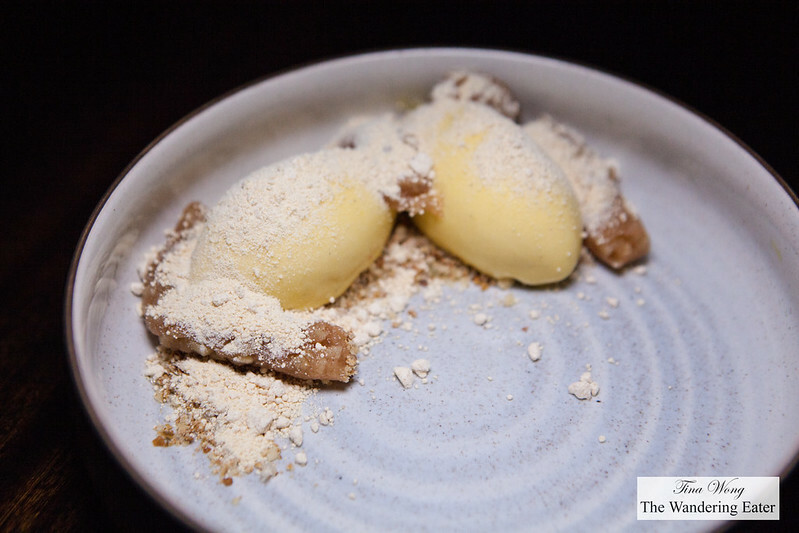 The pumpkin ice cream with caramelized white chocolate crumbs and apple was absolutely delicious. The ice cream was definitely intense of pumpkin flavor with a whiff of clove and cinnamon and the luscious creaminess was phenomenal. The gentle crunchiness from the caramelized white chocolate was a perfect amount of texture but still let the pumpkin flavors sing. If they sold this ice cream by the pint, I would buy them on my way out. Our final dessert of chocolate, beet root sorbet and caramelized whey reads weirdly interesting but for it left us scratching our heads. It’s the issue of the parts of its sum was greater than the whole. The chocolate pudding, crispy chocolate cake pieces, beet meringue shards and drops of sweet caramelized whey hit our palates with a ton of different flavors and textures (and each were done very well) but all of that was too much. That would be the only dud for our entire meal. 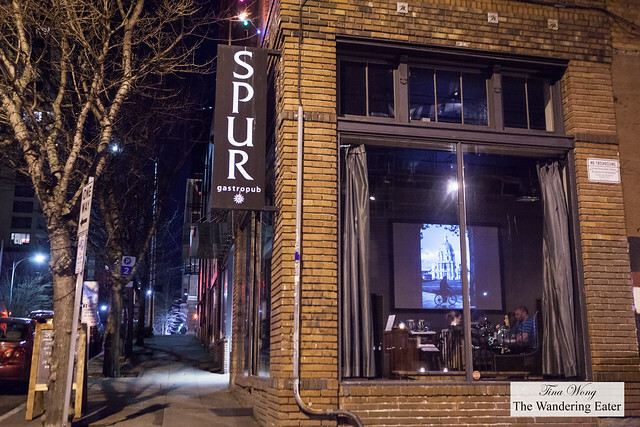 In all, we adore Spur Gastropub and would definitely come back for another meal when I come back to this city. I love how the inventiveness and ambitiousness of the food in a casual atmosphere. The meal we had was almost flawless. The wait staff was friendly and professional. This all adds up to a place that would definitely have a good time.